Today is Noah's Pumpkin Party at Ms. Jas'. He is so excited! The get to wear their costumes to class today and bring snacks for the party. Noah brought a paper home from school Monday that said to bring cookies, chips, drinks, sandwiches or happy. Well after Noah and I talked about it, we had decided to send PB$J sandwiches and make happy bags. So when I got off from work yesterday I picked him up from Nana's and we went shopping. We hit the DG first and got all the things we needed for his happy bags and then on to the B & B to get stuff to make PB&J sandwiches. As we were going through the store Noah decided he did not want to take PB&J sandwiches, he wanted to take popcorn chicken! The child loves popcorn chicken...everybody will like it Mother, he said. How could I argue with that, so I am up this morning cooking popcorn chicken! 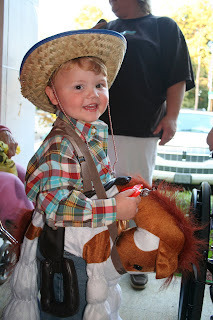 Last year, Noah was a COWBOY! This year he wanted to be SPIDER MAN! The party is this morning so I will send you pictures and a update on how the popcorn chicken went over later. 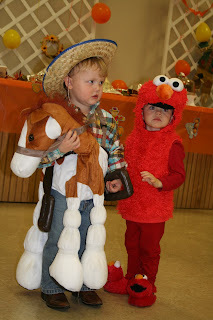 Here are pictures of my baby boy last year as a COWBOY with his friend Drew Jones as ELMO! 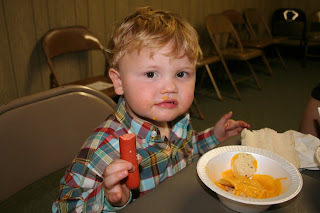 Drew is the son of Brad and Christy Jones. Have a Popcorn Chicken Day! I would vote popcorn chicken over PB&J. I am sure he is talk of the class now since his mom made popcorn chicken. yum! How adorable! You will remember Popcorn Chicken forever! Can't wait to see this year's pics!